This may sound bizarre to some. But now that the recent Virginia TV Reporter shooting false flag has been blown wide open by the independent media, has anyone taken into consideration that the general public is being played in more ways than we are considering on the surface? Up to now, the general narrative throughout independent media is that the main purpose behind the staged shootings of the last several years likely involves a focused agenda on gun control and I agree that may very well be the primary reason. That is often evidenced by statements put out by politicians and crisis actor family members. Also, the timing of these shootings often coincide with U.N. Arms Trade Treaty talks and events. But has anyone considered that the obvious discrepancies in this latest shooting false flag are there on purpose? That's right. As truth seekers and independent thinkers we must take all possibilities into consideration. And I want to suggest that there is a possibility that the degree of sloppiness in this latest false flag shooting may hint at a series of deliberate flaws. By now many readers are thinking, why in the world would the controllers stage an obviously flawed false flag shooting quickly busted by the independent media community within days. The answer may surprise you. Keep in mind that in America we are still in the middle of U.S. military operation Jade Helm 15. 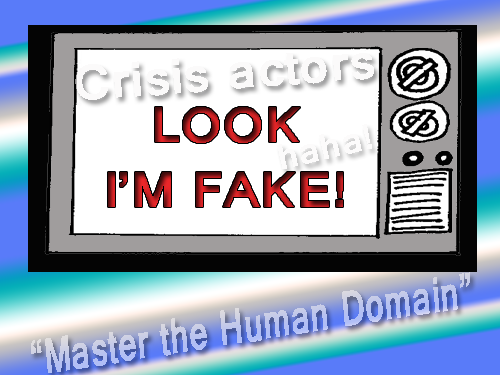 This operation, as many people know, has a stated goal of "Mastering the human domain". This operation is employing many tactics and elements not directly revealed to most of us to monitor the human domain for the purposes of mastering it. Taking this consideration into account wouldn't it make sense to engineer events that cause clear cut divide amongst the people? In the past week we saw many people angry and alarmed that we now have yet another obvious false flag shooting. But we also saw comments from people defending the official story of the shooting and angrily attacking those who dared to refer to this latest shooting as a false flag shooting. Have you considered that THIS may have been the main purpose of the this obvious false flag shooting? To perhaps monitor who is still believing the false flag despite the obvious flaws in it and who is quick to call out the false flag. From the standpoint of, for example, the Jade 2 software being employed in Jade Helm, wouldn't this be the perfect event to monitor and record those who are the resisters and those who are the gullible "trust worthy" zombies? And wouldn't this information be very useful for a future "events"? Could the Jade Helm software be looking for who to track more closely or promote, praise, sabotage or silence? You get the picture. I believe it's important to not be caught off guard. I was watching a baseball game the other day live on the internet and I came across a commercial played repeatedly between innings that made me think. It was a commercial for AT&T. And the commercial reminds the audience that it is now merged with Direct TV. The frightening merger which had been opposed by many took place May of 2014. In this commercial masses of people are walking in the streets and are portrayed in Gotham City style as naive and powerless. They appear to be controlled and influenced by whatever the AT&T god does to them. Echoes of a famous line from The Wizard of Oz is played- "I have a feeling we're not in Kansas anymore", as a huge hypnotizing video image appears on a sky scraper in what appears to be New York City. The crowd of hypnotized people stare at the image in awe. The subliminal suggestions are all over the place. Can this be a hint that the tech giants are about to pull out a new technology on the naive public that will play a role in mastering the human domain? Let's not forget the tech giants do have a major roll in the stated goals of Jade Helm. My point is that perhaps the suggestion is true- Perhaps we are "not in Kansas anymore" when it comes to the progress of the new world order and the planned mastering of the human domain. I want to urge truth seekers to think outside the box that they've created. Stay calm and continue to think critically. Call out their false flag crisis actor events but also be aware there could be a greater goal in these events that is not as easily apparent. That said, it shouldn't surprise anyone that the United Nations is not so coincidentally hosting a historic event in New York City on September 25 2015 called- Transforming Our World: The 2030 Agenda For Sustainable Development. This event will "declare" 91 declarations in what essentially will be a blueprint for the new world order outlining in detail how they plan on controlling every single aspect of human behavior worldwide by taxing and tracking carbon emissions. Of course all of this will be in the name of "sustainable" living. It now appears his global empire or global control grid controlled by the global elite is pretty darn serious about getting their new world order now. For the first time in our lifetimes we are seeing an implementation of a new global order only they are not calling it that. They are calling it many other things but they are careful not to use any buzz words that will alarm anyone. So in light of all the odd stories and incidences unfolding every day, including stories like the latest shooting, let us consider carefully how we categorize these events. Ask yourself, are you thinking the same way now as you did a year or two ago? Are you grounded in truth enough to look twice at every event and to consider possibilities you wouldn't have considered just a few years ago? More than ever, it's not about being right or wrong or knowing more than someone else. Those of us who are awake must have a true sense of the battlefield because the controllers are thinking that way. Now is probably the best time to error on the sided of caution and to align yourself with truth. I personally believe essentially all mass media news is now disseminated and often staged for a specific purpose. Now is the time to prepare your mind for the attempted rollout of the new global order. Start thinking ahead on how to head off this global order and make it obsolete. Get involved in some way. Take action at the smallest level. Spread the information if you do nothing else. Humanity is awakened to their plans and they know it which is why they are moving so fast. I believe possibly the first step in creating and implementing solutions is to focus on unity. This is humanity's toughest challenge and figuring out the unity challenge is the building block by which all other solutions can be built on.